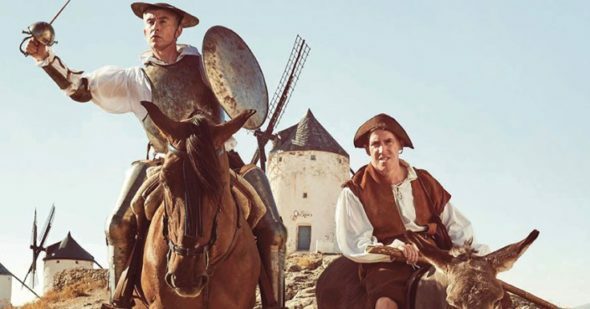 Steve Coogan may be inviting his travel buddy Rob Brydon to join another tasty road trip, but he may as well be asking us if we’re game to ride shotgun. Once again it’s a witty, breezy, sometimes utterly hilarious getaway. If you’re hip to The Trip, The Trip to Italy or even the original The Trip TV series, you know what’s coming. For the uninitiated, it’s Steve and Rob playing slightly fictionalized versions of themselves as they tour a particular region to sample the finest restaurants and write reviews for the U.K. Observer. This time out The New York Times is in on the action, too, as our boys are off on The Trip to Spain. They’ll eat well, deliver sarcastic barbs (Rob: “We welcome Philomena back to the conversation, it’s been a good 5 or 6 minutes.”), and of course try to one up each other with dueling celebrity impersonations from Bowie to Brando and Mick Jagger doing Shakespeare. But in Spain, Roger Moore becomes the new Michael Caine. After trading rapid-fire imitations, Steve detours into a lecture on the Spanish history of the Moors while Rob continues on as Roger. It’s LMAO funny and the film’s most uproarious bit. Director Michael Winterbottom is back for this third go ’round as well, and while you’re right to expect more of the same, all involved sense a need to deepen the characterizations. Understandable, but ultimately a bit of a double edged sword. There’s bittersweet humanity mined from how Steve and Rob have settled into separate lives, but as the running time begins to feel bloated, the sense that this premise is treading water makes the slightest of appearances. Not enough to derail the journey, mind you. These boys are still good fun, and so is The Trip to Spain.